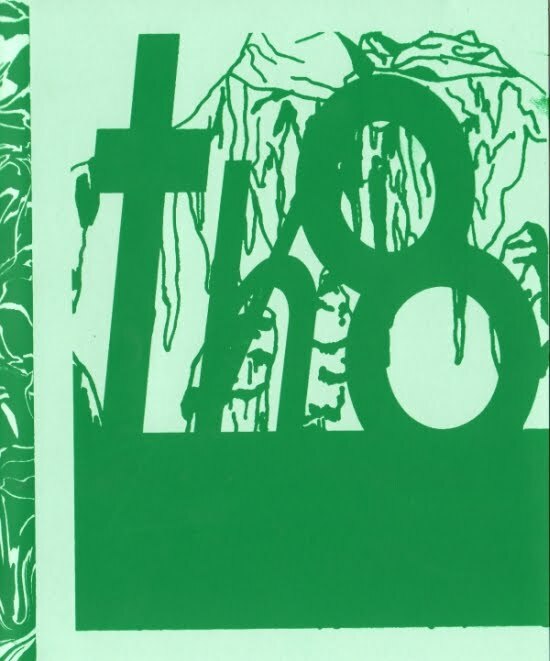 Continuing my reviews of comics purchased at the Brooklyn Comics & Graphics Festival, this is an anthology called (I think) Th8, edited by Zara Messano and Gil Gentile. This thick issue is apparently the final issue. It is printed in what has become a somewhat standard format (since Fort Thunder)--silkscreened cover and photocopied interiors. Unusually, this comic is bound with string--it is very much a hand-made object. And if the format derives from Fort Thunder, the contents do as well. I would say that Ben Jones (and Paper Rad) and C.F. are big influences. But some of the work also reminds me of Sketch Klubb (which itself has a lot of Fort Thunder influences). This page (one of two by Magic Sweater) is one that reminds me a lot of Sketch Klubb. Magic Sweater is apparently an artist from Melbourne, Australia. His website has a huge quantity of his highly amusing drawings. As you can see in this piece, he often uses repeated images--I'm guessing he scans in individual figures then layers them into these dense compositions. Shalo P is a video artist from San Francisco. His (her?) work here is comics deconstructed. There are recognizable comics elements--panels, word balloons--but the drawing spills out of those forms, falling over them, overlapping. I find it quite appealing (if a little disturbing in its violence). Th8 also includes interviews with C.F. and Vanessa Davis. The C.F. interview, apparently conducted as a list of questions sent to C.F., is amusing because C.F. is frustrated and even angered by some of the questions. 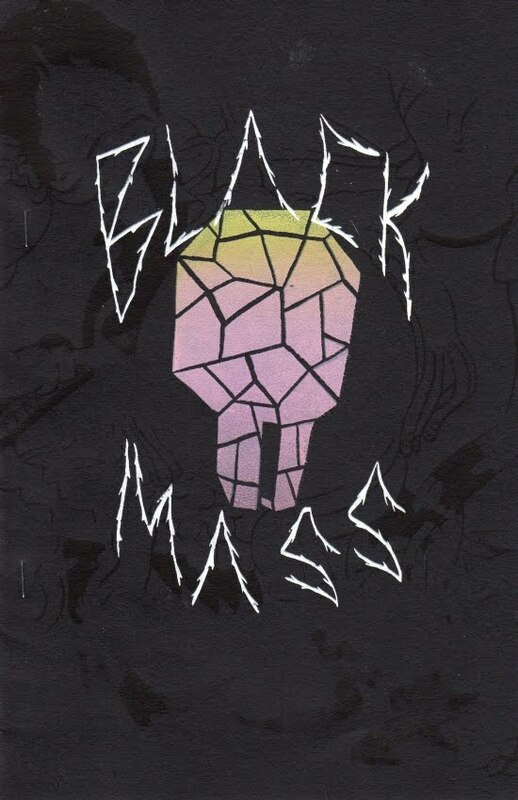 In Black Mass #2, Patrick Kyle follows the format described above--silkscreened cover, photocopied interiors. But the contents are not as radical as that in Th8. Kyle tells a more-or-less conventional story. A man named Turdswallo Blackteeft who has left his home in Transylvania for "Canadia." Turdswallo is needed by his relatives in Transylvania to help utter the "true name" of an oppressive king. But Turdswallo is injured in Canadia. This is issue 2 and there is a third issue, so this is just a section of the story, and a bit confusing because of it. I'd like to see a book collection. The storytelling requires a little work on the part of the reader. There are no distinct panels, so the sequential actions visually bleed into one another. However, it is a lot more of a traditional comic than Th8. Kyle's rubbery drawing is especially appealing. Creative Time is an art organization in New York. 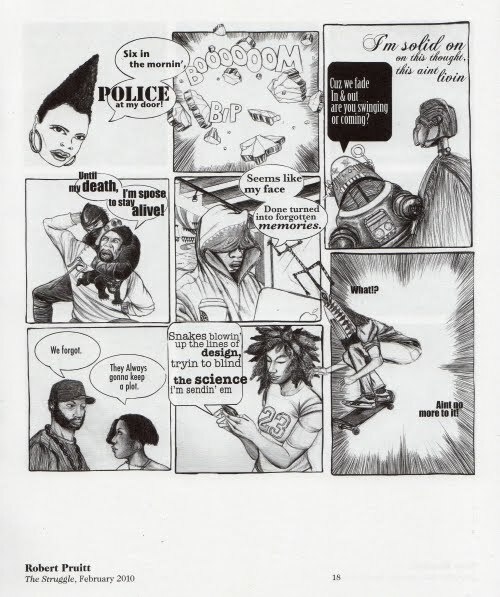 Creative Time Comics was a two year web project where a variety of artists were invited to do comics on any issue of the day they cared to address. Some of the artists are artists mostly associated with comics, and some are more associated with the fine arts scene. 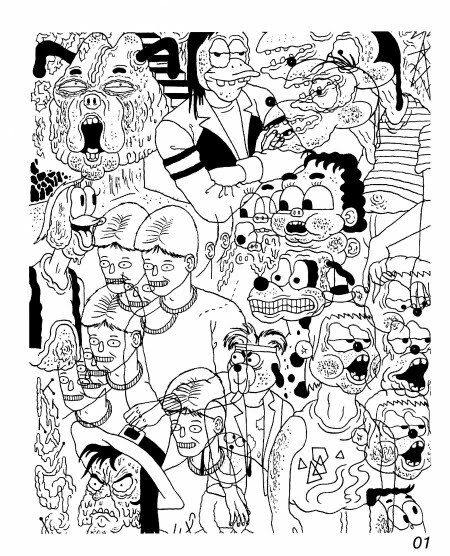 This publication represents the overlap of comics and art that typifies the Brooklyn Comics and Art Festival. However, one thing that distinguishes Creative Time Comics from most of what was on display is the high-quality format--full-color pages on nice paper. Creative Time is supported by a lot of foundations and companies, just like any other arts organization. 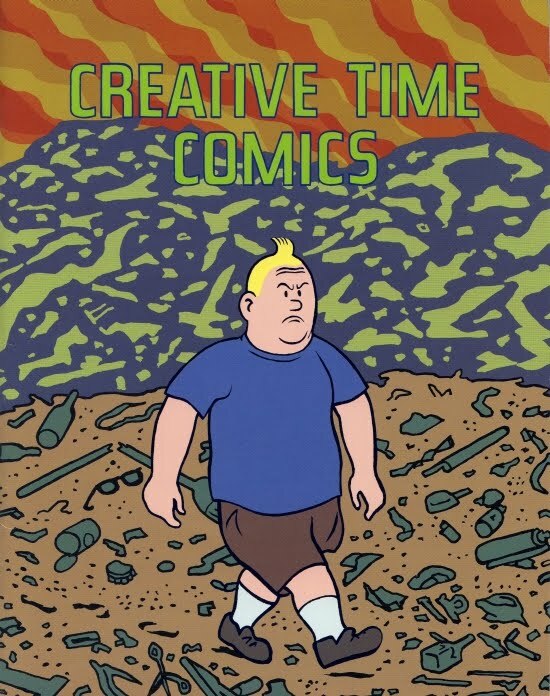 The cover is by Michael Kupperman and relates to a story he has inside, where Tintin has become an angry American Rush Limbaugh-like character. Robert Pruitt should be familiar to most of my Houston readers. The artist, formerly from Houston, now in Chicago, was part of the Otabenga Jones and Associates group. 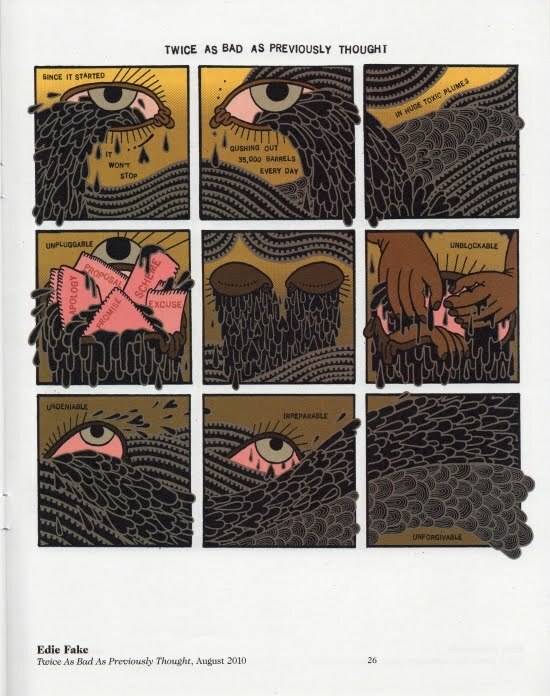 All of those artists had a distinct comics influence, Pruitt included. So he seems a natural for a project like this, but the work here is not all that interesting. He is much better as an artist doing large scale single-image works designed for display on the wall. This is one of the pitfalls when you try to bring people in from the art world into comics--no matter how sympathetic they are with comics, they may not rise to the occasion. Still, I think this is something that should be attempted, and I'm glad Creative Time and Pruitt made the effort. I have known Jon Lewis for almost 20 years--he, Tom Hart, Jason Lutes and Ed Brubaker were the young punk cartoonist gang in Seattle when I lived there working for Fantagraphics. He is best known for his comic series True Swamp, which I believe is still ongoing online. This small comic, published by Uncivilized Books, is a limited edition of 200. I would not be surprised if Lewis sold every single one of them at the Brooklyn show. In any case, you apparently cannot order it from Uncivilized Books, at least not yet. Update: You can now order this book from the Uncivilized Books site. 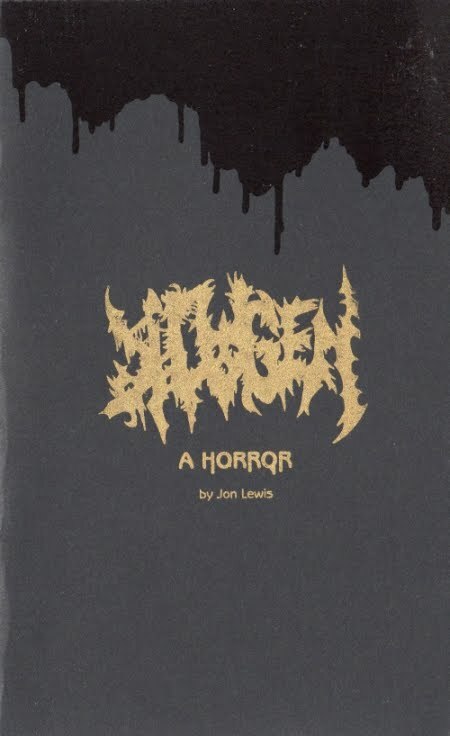 The story of Klagen, according to Lewis, is about a "death cult." At the convention, I asked him if he meant something like Aum Shinrikyo, but he meant something with less purpose that that. After all, Aum Shinrykyo's attacks and attempted attacks were part of a strategy, not an end unto themselves. However, the story in this comic is apparently just a prologue to a longer work. We encounter the cult without understanding much of it. Klagen is the name of a rock band in the book--and their relationship to the cult is not obvious. The book has an interesting design. It is drawn in pencil, but where the cult manifests its occult powers, we see inky black silhouettes. 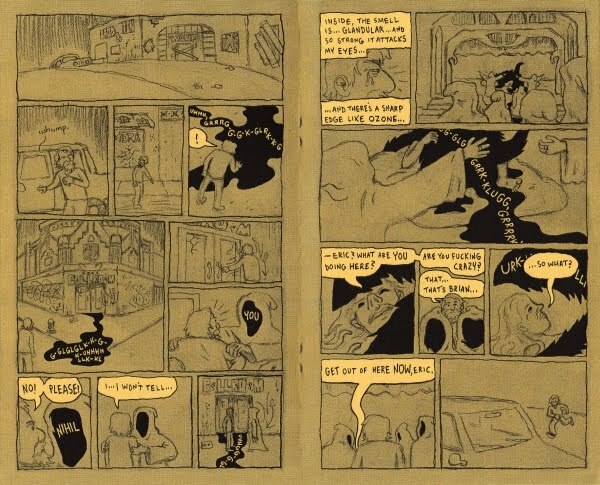 On top of this, there is a grey haze over all the pages, except where the word balloons and narration blocks are. This makes them pop visually. The paperstock itself is a bilious yellow, fitting with the gloom and horror of the story. One plot point that I had a hard time swallowing was that after seeing a strange black spirit form copulating on an alter, and after seeing his friend Brian die before his eyes, the protagonist Eric still goes to the Klagen concert. I don't know--if I were Eric, I might be a little too freaked out by what I had just seen to go check out a rock concert! More reviews at part 1, part 3, and part 4 (and more to come). Thanks for reviewing Klagen, Robert. It was really nice chatting at the show. One comment-- Tom K will have copies of it available to purchase through the Uncivilized Books website within a couple of weeks. Hi Robert. Just a note to let you and your readers know that Jon's book, and other items from the Brooklyn Fest are now available on the Uncivilized Books site (http://www.uncivilizedbooks.com). I updated the text to reflect this (including a link to the Klagen page of Uncivilized Books).